You are currently browsing the category archive for the ‘MBOM’ category. 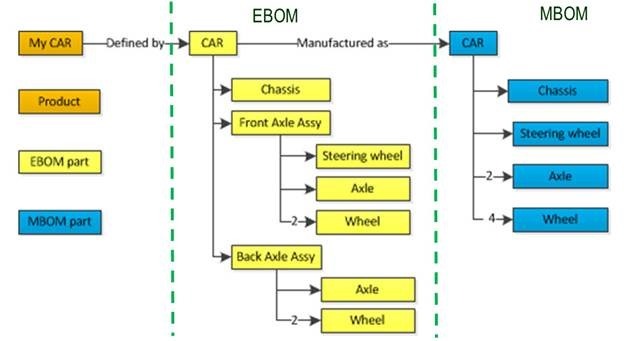 In my series describing the best practices related to a (PLM) data model, I described the general principles, the need for products and parts, the relation between CAD documents and the EBOM, the topic of classification and now the sensitive relation between EBOM and MBOM. The EBOM represents the engineering (design) view of a product, structured in a way that it represents the multidisciplinary view of the functional definition of the product. The EBOM combined with its related specification documents, models, drawings, annotations should give a 100 % clear definition of the product. The MBOM represents the manufacturing view of a product, structured in a way that represents the way the product is manufactured. This structure is most of the time not the same as the EBOM, due to the manufacturing process and purchasing of parts. To accommodate a more advanced integration with PDM systems, ERP vendors began to offer an EBOM capability also in their system as PDM systems often worked around the EBOM. These two approaches made it hard to implement “real” PLM where (BOM) data is flowing through an organization instead of stored in a single system. 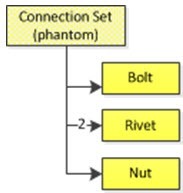 A disconnect between the iterative engineering domain and the execution driven ERP domain. The EBOM is under continuous change (unless you have a simple or the ultimate product) and these changes are all related to upstream information, specifications, requirements, engineering changes and design changes. An ERP system is not intended for handling iterative processes, therefore forcing the user to work in a complex environment or trying to fix the issue through heavy customization on the ERP side. Global manufacturing and outsourced manufacturing introduced a new challenge for ERP-centric implementations. This would require all manufacturing sites also the outsourced manufacturers the same capabilities to transfer an EBOM into a local MBOM. And how do you capitalize the IP from your products when information is handled in a dispersed environment? The solution to this problem is to extend your PDM implementation towards a “real” PLM implementation providing the support for EBOM, MBOM, and potential plant specific MBOM. All in a single system / user-experience designed to manage change and to allow all users to work in a global collaborative way around the product. MBOM information then will then be pushed when needed to the (local) ERP system, managing the execution. Note 1: Pushing the MBOM to ERP does not mean a one-time big bang. When manufacturing parts are defined and sourced, there will already be a part definition in the ERP system too, as logistical information must come from ERP. The final push to ERP is, therefore, more a release to ERP combined with execution information (when / related to which order). In this scenario, the MBOM will be already in ERP containing engineering data complemented with manufacturing data. Therefore from the PLM side we talk more about sharing BOM information instead of owning. Certain disciplines have the responsibility for particular properties of the BOM, but no single ownership. Note 2: The whole concept of EBOM and MBOM makes only sense if you have to deliver repetitive products. For a one-off product, more a project, the engineering process will have the manufacturing already in mind. No need for a transition between EBOM and MBOM, it would only slow down the delivery. When extracting an EBOM directly from a 3D CAD structure, there might be subassemblies in the EBOM due to a logical grouping of certain items. You do not want to see these phantom assemblies in the MBOM as they only complicate the structuring of the MBOM or lead to phantom activities. In an EBOM-MBOM transition these phantom assemblies should disappear and the underlying end items should be linked to the higher level. In the EBOM, there might be materials like a rubber tube with a certain length, a strip with a certain length, etc. These materials cannot be purchased in these exact dimensions. Part of the EBOM to MBOM transition is to translate these EBOM items (specifying the exact material) into purchasable MBOM items combined with a fitting operation. For make end-items, there are usually approved manufacturers defined and it is desirable to have multiple manufacturers (certified through the AML) for make end-items, depending on cost, capacity and where the product needs to be manufactured. Therefore, a make end-item in the EBOM will not appear in a resolved MBOM. Are EBOM items and MBOM items different? There is a debate if EBOM items should/could appear in an MBOM or that EBOM items are only in the EBOM and connected to resolved items in the MBOM. Based on the previous descriptions of the various EBOM items, you can conclude that a resolved MBOM does not contain EBOM items anymore in case of multiple sourcing. Only when you have a single manufacturer for an EBOM item, the EBOM item could appear in the MBOM. 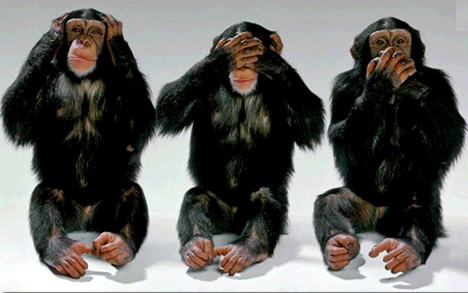 Perhaps this is current in your company, but will this stay the same in the future? It is up to your business process and type of product which direction you choose. Coming back to one-off products, here is does not make sense to have multiple manufacturers. In that case, you will see that the EBOM item behaves at the same time as an MBOM item. Luckily I reached the 1000 words so let´s be short on this debate. 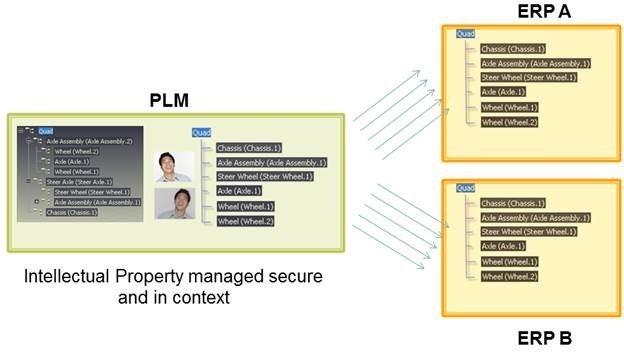 In case you want an automated flow of information between PLM and ERP, it is important that shared data is connected through a unique identifier. Automation does no need intelligent numbering. Therefore giving parts in the PLM system and the ERP system a unique, meaningless number you ensure guaranteed digital connectivity. If you want to have additional attributes on the PLM or ERP side that describe the part with a number relevant for human identification on the engineering side or later at the manufacturing side (labeling), this all can be solved. An interesting result of this approach is that a revision of a part is no longer visible on the ERP side (unless you insist). 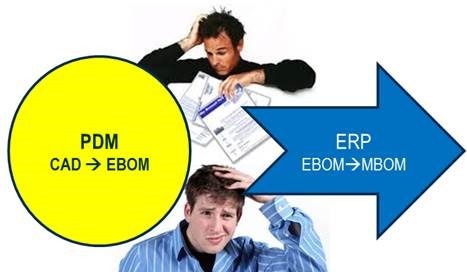 Each version of the MBOM parts is pointing to a unique version of an MBOM part in ERP, providing an error free sharing of data. Life can be simple if you generalize and if there was no past, no legacy and no ownership of data thinking. The transition of EBOM to MBOM is the crucial point where the real PLM vision is applied. If there is no data sharing on MBOM level, there are two silos, the characteristic of the old linear past. What do you think? Is more complexity needed? I will be soon discussing these topics at the PDT2015 in Stockholm on October 13-14. Will you be there ? 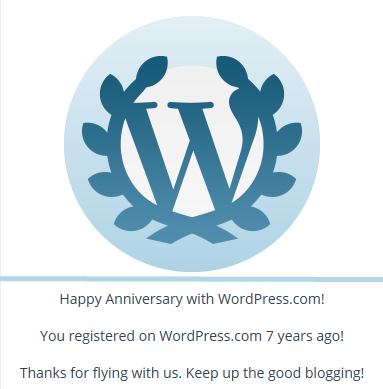 Two weeks ago I got this message from WordPress, reminding me that I started blogging about PLM on May 22nd in 2008. During some of my spare time during weekends, I began to read my old posts again and started to fix links that have been disappearing. Warning: This is a long post, full of generalizations and a conclusion. The mid-market companies can be characterized as having a low-level of staff for IT and strategic thinking. Mid-market companies are do-ers and most of the time they are good in their domain based on their IP and flexibility to deliver this to their customer base. I did not meet mid-market companies with a 5-year and beyond business vision. Mid-market companies buy systems. They bought an ERP system 25-30 years ago (the biggest trauma at that time). They renewed their ERP system for the Y2K problem/fear and they switched from drawing board towards a 2D CAD system. Later they bought a 3D CAD system, introducing the need for a PDM system to manage all data. PLM is for me a vision, a business approach supported by an IT-infrastructure that allows companies to share and discover and connect product related information through the whole lifecycle. PLM enables companies to react earlier and better in the go-to-market process. Better by involving customer inputs and experience from the start in the concept and design phases. Earlier thanks to sharing and involving other disciplines/suppliers before crucial decisions are made, reducing the amount of iterations and the higher costs of late changes. Seven years ago I believed that a packaged solution, combined with a pre-configured environment and standard processes would be the answer for mid-market companies. The same thought currently PLM vendors have with a cloud-based solution. Take it, us it as it is and enjoy. Here I have changed my opinion in the past seven years. Mid-market companies consider PLM as a more complex extension of PDM and still consider ERP (and what comes with that system) as the primary system in the enterprise. PLM in mid-market companies is often seen as an engineering tool. PLM for the mid-market – mission impossible? PLM for the SMB – a process or culture change ? Mid-market PLM – what did I learn in 2009 ? Who decides for PLM in a mid-market company ? More on: Who decides for PLM in a mid-market company ? 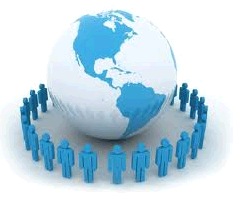 In the past seven years, globalization became an important factor for all type of companies. Companies started offshoring labor intensive work to low-labor-cost countries introducing the need for sharing product data outside their local and controlled premises. Also, acquisitions by larger enterprises and by some of the dominant mid-market companies, these acquisitions introduced a new area of rethinking. Acquisitions introduced discussions about: what are real best practices for our organization? How can we remain flexible, meanwhile adapt and converge our business processes to be future ready? To understand and implement the value of PLM, you need to have skills and understanding of more than just a vendor-specific PLM system. You need to understand the basics of change processes (Engineering Change Request, Engineering Change Order, Manufacturing Change Order and more). And you need to understand the characteristics of a CAD document structure, a (multidisciplinary) EBOM, the MBOM (generic and/or plant specific) and the related Bill of Processes. This education does not exist in many countries and people are (mis-)guided by their PLM/ERP vendor, explaining why their system is the only system that can do the job. As ERP systems were introduced long before PLM (and PDM), these systems are often considered by the management of a mid-market company as the core. All the other tools should be (preferably) seen as an extension of ERP and if possible, let´s implement ERP vendor´s functionality to support PLM – the Swiss knife approach – one tool for everything. This approach is understandable as at the board level there are no PLM discussions. Companies want to keep their “Let´s do it”-spirit and not reshuffle or reorganize their company, according to modern insights of sharing. Strangely enough, you see in many businesses the initiative to standardize on a single ERP system first, instead of standardizing on a single PLM approach first. PLM can bring the global benefits of product portfolio management and IP-sharing, where ERP is much more about local execution. A lot of the reasons why PLM has the challenge to become successful have to do with its broad scope. PLM has an unclear definition and most important, PLM forces people to share data and work outside their comfort zones. Nobody likes to share by default. Sharing makes day-to-day life more complicated, sharing might create visibility on what you actually contribute or fix. In many of my posts, I described these issues from various viewpoints: the human brain, the innovators dilemma, the way the older generation (my generation) is raised and used to work. Combined with the fact that many initial PLM/PDM implementations have created so many legacies, the need to change has become a risk. In the discussion and selection of PLM I have seen many times that in the end a company decides to keep the old status quo (with new tools) instead of really having the guts to move toward the future. Often this was a result of investors not understanding (and willing to see) the long term benefits of PLM. How to get users excited or more committed to a new PLM system? The final and most significant upcoming change is the fact that we are entering a complete new era: From linear and predictable towards fast and iterative, meaning that classical ways we push products to the market will become obsolete. The traditional approach was based on lessons learned from mechanical products after the second world-war. Now through globalization and the importance of embedded software in our products, companies need to deliver and adapt products faster than the classical delivery process as their customers have higher expectations and a much larger range to choose from. The result from this global competitiveness is that companies will change from delivering products towards a more-and-more customer related business model (continuous upgrades/services). This requires companies to revisit their business and organization, which will be extremely difficult. Business wise and human change require new IT concepts – platform? / cloud services? / Big data? Older enterprises, mid-market and large enterprises will be extremely challenged to make this change in the upcoming 10 years. It will be a matter of survival and I believe the Innovator´s Dilemma applies here the most. The digital transformation is apparent as a trend for young companies and strategic consultants. This message is not yet understood at the board level of many businesses. Did you notice PLM is changing? Documents or Intelligent Data ? PLM is dead, long live …… ? 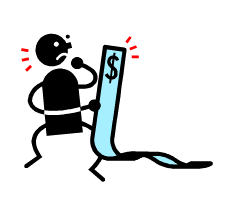 I also wrote about ROI – a difficult topic to address as in most discussions related to ROI, companies are talking about the costs of the implementation, not about the tremendous larger impact a new business approach or model can have, once enabled through PLM. Most PLM ROI discussions are related to efficiency and quality gains, which are significant and relevant. However these benefits are relative small and not comparable with the ability to change your business (model) to become more customer centric and stay in business. PLM: What is the target? A (too) long post this time however perhaps a good post to mark 7 years of blogging and use it as a reference for the topics I briefly touched here. PLM has many aspects. You can do the further reading through the links. From the statistics it is clear that the education part scores the best – see rankings. For future post, let me know by creating a comment what you are looking for in this blog: PLM Mid-Market, Education, PLM and ERP, Business Change, ROI, Digitalization, or …?? If your are reading blogs related to PLM, I am sure you have seen a blog post from Stephen Porter (Zero Wait State), for example: The PLM state the walking dead – PLM projects that never end. Like Stephen, I am often triggered by an inspiring book, a touching movie or a particular song combined with my PLM-twisted brain I relate the content to PLM (there is no official name for this abnormality yet). As I was just coming back from a discussion around PLM tools, BOMs and possible PLM expansion strategies in a company with customers and resellers, my twisted brain was thinking about two PLM related topics that were in the air tonight (at least for me). You must have noticed it, and if not, now you are aware: Jim Brown and Chad Jackson started a PLM duel discussion platform at Engineering.com to bring PLM related topics to the table: TECH4PD. Watch them argue and I hope with your feedback and the feedback of the PLM community, it will help us to make up your mind. The topic they discussed in their first session was about two different approaches you can have for PLM. Either start from a best in class PLM platform or build your PLM support by using dedicated applications and integrate them. This is to my opinion one of the fundamental PLM topics to discuss. And if I would have to vote (as Jim and Chad ask you to do so), I would first vote for Chad (integration of software) and after a second thought, vote for Jim (best in class PLM). So see my problem. If I relate the discussion to my experiences with different companies, I realized that probably both answers are correct. In case you are an OEM you likely would benefit from a best in class PLM platform, as PLM systems aim to cover and integrate all data through the product lifecycle in a single system, single data model, etc.. So a good PLM platform would have the lowest cost of ownership in the long term. OEMs are by definition not the smallest companies and in general have the highest need for global coverage. But not every company is an OEM. Many mid-market companies are specific suppliers,serving different OEMs and although they also develop products, it is in a different context of market delivery. There is a need to be flexible, as their products used by OEMs might become obsolete in the near term, they need to be more flexible, reactive. and the best in class companies innovate and are proactive. For that reason they do want to invest in a best in class PLM system, which somehow brings some rigidness , but keep on optimizing these areas where improvement is needed in their organization, instead of changing the organization. I believe this question will remain in the air until we get a clear split between these two types of PLM. There is a trend splitting classic PLM (OEM oriented) and new upcoming PLM solutions. Till that time, we will be confused by the two approaches. It is a typical PLM disease and the reason you do not experience the same discussion for ERP is obvious. ERP is much more a linear process that both for the OEMs and mid-market companies is aiming to manufacture products or goods at a single location. The differentiation is in global manufacturing. Where do you manufacture your products ? Here the OEMs might have a bigger challenge. Global manufacturing is a PLM challenge too, which is in the air. This is the topic most visited in my blog and I am preparing a session with the MBOM as theme combined with PLM for the upcoming PLM Innovation US conference end of October in Atlanta. I am not going to disclose all the content here, but I will give you some thoughts that are in the air. Companies historically manage their BOM in ERP, but as a result of globalization they now need to manage their manufacturing BOM at different locations. But each location has its own ERP and a local (M)BOM. What to do ? Do you need an EBOM and MBOM in PLM ? Cannot we have a single BOM ? What about search technology ? I hope you will participate in both discussions that are the air, either by commenting to this blog, through Tech4PD, your blog (Oleg ? 😉 ) or your participation at PLM Innovation US. Looking forward to discuss with you about what you believe is in the air tonight. Conclusion (as usual): It is a busy time – we are heading towards the end of the year, which for some reason is a deadline for many companies. So no long thought processes this time, just what is in the air. May 24th, 2008 was the date I posted my first blog post as a Virtual Dutchman aiming to share PLM related topics for the mid-market. I tried to stay away from technology and function/feature debates and based on my day to day observations, describe the human side of the PLM – what people do and why . All from a personal perspective and always open to discuss and learn more. Looking back and reviewing my 86 posts and 233 comments so far, I would like to share a summary around some of the main topics in my blog. In 2008, PLM awareness was much lower – at that time one of the reasons for me to start blogging. There was still a need to explain that PLM was a business strategy needed beside ERP and PDM. PLM will bring more efficiency, and in better quality, new innovative products to the market due to better collaboration between teams and departments. At that time the big three, Dassault Systemes, Siemens and PTC were all offering a very CAD-centric, complex approach for PLM. There was no real mid-market offering, although their marketing organizations tried to sell as-if a mid-marketing offering existed. Express, Velocity, ProductPoint where are these offerings now ? The new PLM providers focus on a disconnect between PDM and PLM, as in particular the handling of enterprise data outside the PDM scope is a white space for many mid-market companies that need to operate on a global platform. In the relation between PLM and ERP, I haven’t seen a big change the past four years. The two dominating ERP originated vendors, SAP and Oracle were paying attention to PLM in 2008 in their marketing and portfolio approach. 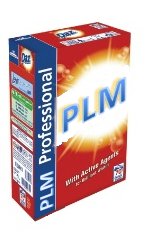 However their PLM offerings in my perception, haven’t moved much forward. SAP is selling ERP and yes there is a PLM module and Oracle is having PLM systems, but I haven’t seen a real targeted PLM campaign explaining the needs and value of PLM integrated with ERP. Historically ERP is the main IT-system and gets all the management attention. PLM is more considered something for engineering (and gets less focus and budget). Understanding PLM and how it connects to ERP remains a point of attention and the crucial point of interaction is the manufacturing BOM and the place where it is defined. The two most read posts from my blog are: Where is the MBOM and next Bill of Materials for Dummies – ETO, indicating there is a lot of discussion around this topic. There are three new trends that became more clear the past four years. The first one to mention is the upcoming of Search Based Applications (SBA). Where PLM systems require structured and controlled data, search based applications assist the user by “discovering” data anywhere in the organization, often in legacy systems or possible in modern communication tools. The second trend is the cloud. Where two-three years ago social media combined with PLM was the hype as a must for product innovation and collaboration, currently cloud is in focus. Mainly driven and coming for the US, where the big marketing engine from Autodesk is making sure it is on the agenda of mid-market companies. In Europe there is less a hype at this moment, different countries and many languages to support plus discussions around security take the overhand here. For me a cloud solution for sure is lowering the threshold for mid-market companies to start implementing PLM. However how to make the change in your company ? It is not only an IT-offering. Like a similar discussion around Open Source PLM, there is still a need to provide the knowledge and change push inside a company to implement PLM correct. Who will provide these skills ? The third trend is the applicability of PLM systems outside the classical manufacturing industries. I believe PLM requires a change in an organization not only from the IT perspective but more important from the way people will work in an organization and the new processes they require. The change is in sharing information, making it visible and useful for others in order to be more efficient and better informed to make the right decisions much faster. This is a global trend and you cannot stay away from it. Keeping data locked in your reach might provide job security but in the long term it kills all jobs in the company as competiveness is gone. Modern companies with a new generation of workers will have less challenges with this change and I will try to support the change with arguments and experiences from the field. 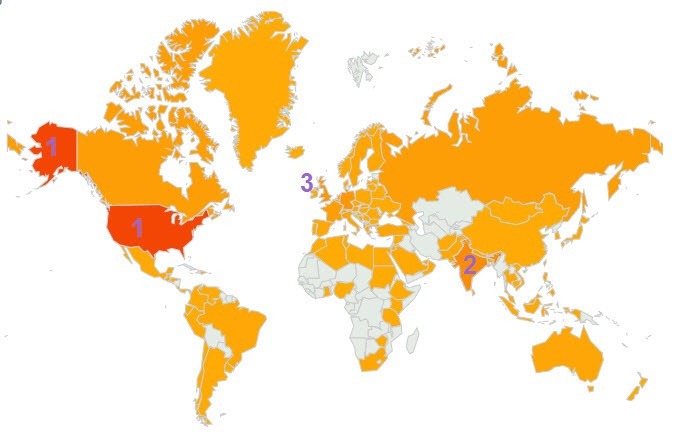 Since February this year, WordPress provides much more statistics and interesting is the map below indicating in which countries my blog is read. As you can see there are only a few places left on earth where PLM is not studied. Good news !! Although most of my observations come from working in Europe, it is the US that provides the most readers (30 %) , followed by India (9 %) and on the third place the UK (6 %). This might be related to the fact that I write my blog in English (not in 100 % native English as someone commented once). It makes me look forward to be in October in Atlanta during the PLM Innovation US conference to meet face to face with many of my blog readers and share experiences. Reading back my posts since 2008, it demonstrated for me that the world of PLM is not a static environment. It is even that dynamic that some of the posts I wrote in the early days have become obsolete. At the end of 2008 I predicted the future of PLM in 2050 – here we are on the right track. There is still enough blogging to do without falling into repetitions and I am looking forward to your opinion, feedback and topics to discuss. Single version of truth ? For this person the conclusion was that once data is stored in a system, it is managed. However what the company never tried was to track each requirement individually (and its possible change) during the engineering process and have a direct connection to regulatory demands. In that area Excel, people’s knowledge and stored documents were used to collaborate. Off course with the late discovery of errors and several extra iterations due to it. As long as this company does not understand that the PLM system is not yet another tool to store data, but an enabler to work different and more efficient, these tools based statements will not bring them further. But as nobody get fired for selecting a well-known ERP system, but trying to change the way people work is a risk, often the first option is chosen. 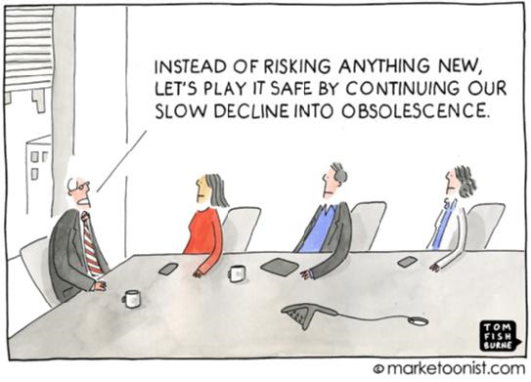 And the more conservative the company culture, the more likely this will happen. In a last week meeting I met a VP of a business group of a real global company. I am stressing the word real as there are many global companies, that actually have one main location where the IP and influence comes from – as compared to the real global companies where all around the world the knowledge and IP of the company is invented and spread from there. Although the discussion was on the current status and quality of the tools in use, during breaks we concluded that although the discussion is about tools, the hardest part for implementing PLM in their company is to master and motivate the changes in the way of working towards the users. Another interesting statement of this VP was also that they are in the process of bringing all engineering data coming from different disciplines in their R&D / PLM environment. 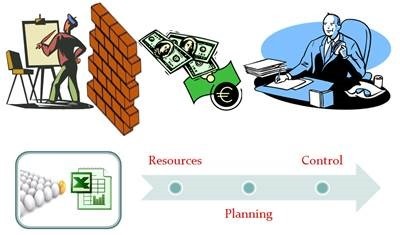 Originally it was the ERP system that was used to combine all data coming from different disciplines. However the disadvantage was that this product definition resided partly in an ERP (there is no concept of a single ERP as manufacturing differ so much globally) and partly in PLM. Their future plan was therefore to extend the coverage of PLM toward the whole preparation for manufacturing – my favorite topic too: see Where is the MBOM ? PLM Customers: Make sure that change of doing business is the target of your PLM implementation – do not look for tools only – check with your implementer and vendor which experience they have. PLM Implementers: Schedule time and activities during the implementation to understand the business change and the customer to adapt. It is a different type of skill required but as important. In my previous post, BOM for Dummies related to Configure To Order, I promised to come back on the special relation between the items in the BOM and the CAD data. I noticed from several posts in PLM and PDM groups that also the importance of CAD data is perceived in a different manner, depending on the background of the people or the systems they are experienced with. So I would like to start with some general statements based on these observations. People who are talking about the importance of CAD data and product structures are usually coming from a background in PDM. In an environment where products are designed, the focus is around data creation, mostly CAD data. The language around parts in the BOM is mostly targeting design parts. So in a PDM environment CAD data is an important topic – therefore PDM people and companies will talk about CAD data and vaults as the center of information. 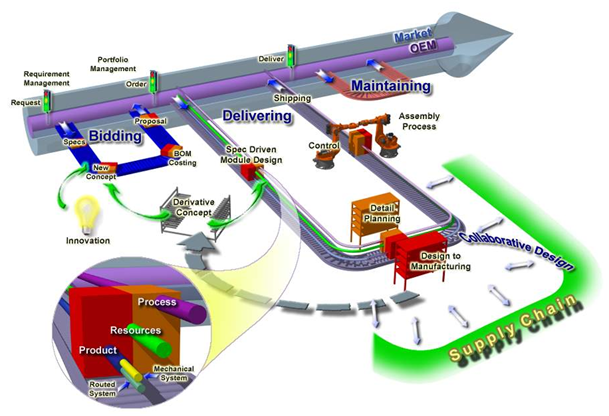 When you are working in a PLM environment, you need a way to communicate around a product, through its whole lifecycle, not only the design phase but also supporting manufacturing phases, the possible changes of an existing product through engineering changes, the traceability of as-built data and more. In a PLM environment, people have the physical part (often called the ERP part) in mind, when they talk about a part number. As PLM covers product information across various departments and disciplines, the information carrier for product information cannot be the CAD data. The BOM, usually the mBOM, is the main structure used to represent and produce the product. Most parts in the mBOM have a relation to a CAD document (in many companies still the 2D drawing). Therefore PLM people and companies understanding PLM will talk about items and products and their lifecycle as their center of information. The above generalizations have to be combined with the different main business processes. In a strict Engineering To Order environment, where you design and build a solution only once for a specific customer, there is no big benefit of going through an eBOM and mBOM transition. During the design process the engineer already has manufacturing in mind, which will be reflected in the CAD structure they build – sometime hybrid representing both engineering and manufacturing items. In such an environment CAD data is leading to build a BOM structure. And in cases where engineering is done in one single 3D CAD system, the company might use the PDM system from this vendor to manage their Bill of Materials. The advantage of this approach is that PDM is smoothly integrated with the design environment. However it restricts in a certain matter the future as we will see in further reading. Not everyone needs the Engineering to Order process ! Moving to an integrated, multi-disciplinary engineering process or changing the main process from Engineering To Order to Built To Order / Configure To Order will cause major challenges in the company. I have seen in the recent past, several companies that would like to change their way of working from a CAD centric Engineering To Order process towards a more Built to Order or Configure To Order process. The bottle neck of making this switch was every time that engineering people think in CAD structures and all knowledge is embedded in the CAD data. They now want to configure their products in the CAD system. When I configure my products around a CAD structure, what should I do with data from other disciplines (Electrical/Tooling/Supplier data) ? When I upgrade my 3D CAD system to a new version, do I need to convert all old CAD data to the newest versions in order to keep my configurations alive? 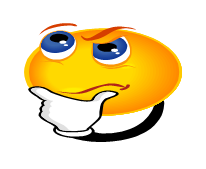 When configuring a new customer solution, do I need to build my whole product in CAD in order to assure it is complete? 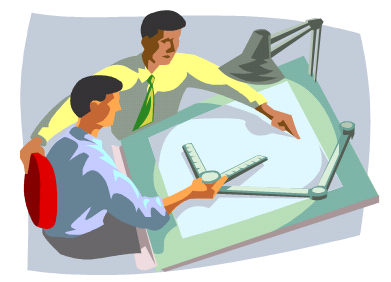 In Configure to Order the engineering BOM and manufacturing BOM are different. Does this mean that when I go through a new customer order, all CAD data need to be handled, going through eBOM and mBOM transition again? In the case of order fulfillment in a Configure to Order process, the CAD structure is not touched as configuration of the product is available based on items. Each item in the mBOM has it relations to CAD data or other specifying information. In the case of Built To Order, a huge part of the product is already configured, like in Configure To Order. Only new interfaces or functionality will go through a CAD design process. This new design might be released through a process with an eBOM to mBOM transition. In cases where the impact or the amount of data created in engineering is not huge, it is even possible to configure the changes immediately in an mBOM environment. A second point, which is also under a lot of discussion in the field ( PLM interest groups), is that PDM is easily to introduce as a departmental solution. The engineering BOM is forwarded to manufacturing and there further (disconnected) processed. The step from PDM to PLM is always a business change. PLM requires an adaptation of all departments to work different and together around a single product definition. Especially in a mid-market company, this is a big issue, as all product knowledge is stored in the CAD data and the knowledge how to produce the product is stored in the mBOM on the ERP side. These environments are often disconnected. Conclusion: In the context of PDM the importance of CAD data is clear and for companies following a strict Engineering To Order process the main source of product knowledge. Companies following the Built To Order / Configure To Order process should configure their products around items to keep flexibility towards the future. Companies with the intention to move to Built To Order or Configure To Order should not invest too much in CAD data configuration as it creates a roadblock for the future. In my next post I will address the question that comes up from many directions, addressed by Jim Brown and others, as discussed in one of his recent posts around a PLM standard definition and more …. This is the third post on Bill of Material handling for different types of companies, this time the focus on Configure To Order (CTO). In the CTO process, products are assembled and configured based on customer requirements. This means there is no more engineering needed when customer requirements are known. CTO examples are, the ordering process of a car with all its options, or ordering a personal computer over the internet. So what has Configure To Order to do with PLM as there is no engineering? The main PLM activity takes places when designing the configurable product. Designing a product that is configurable, requires a complete different approach as compared to Engineering to Order or Build to Order. Although we see a similar Configure to Order activity in the R&D departments of companies that follow the Build to Order process. They are also designing products or modules that can be used as-is in customer specific orders as part of the solution. The challenge of CTO is to design products that are modular, and where options and variants are designed on a common platform with common interfaces. If you look to the dashboard of a car you will see placeholders for additional options (in case you have the minimal car version) and also you might see that for example the radio display in a basic car version differs from the complete board computer in the luxury version. The common platform is one dashboard, fitting to numerous options. An engineering department will not focus on designing and defining each of the possible combinations of options as this would be impossible to manage. What can be managed is the common platform (the baseline) and all different options on top of this baseline. So what happens with the BOM? The initial design of configurable products goes through similar steps as the BTO process, which means starting from a conceptual BOM, moving to an Engineering BOM (eBOM) and finally produce a BOM for manufacturing (mBOM). The difference is that in the CTO process the mBOM is not developed for just one product, but contains all definitions for all possible products. In this situation we talk about a generic mBOM. Only when a customer order exists, the generic mBOM is resolved into a specific mBOM for this customer order, which then can be sent to the ERP system for execution. Both methods are used most of the time for non-configurable products. The revision and date effectivity are used to be able to track the product history through time and therefore to have full traceability. But this does not work if you want to configure every time a customer specific order. In that case we use unit or option based filtering. The benefit of this filtering approach is that there is a minimum of redundancy of data to manage. This makes it a common practice in the aerospace and automotive industry. An example describing all the complexity can be found for example here, but I am sure on this level there are enough publications and studies available. And what about the CAD ? What PLM functions are required to support Configure to Order ? Project management – not so much focus here as the delivery project for a customer does not require much customer interaction. Of course, the product development processes requires advanced capabilities which I will address later in a future post. 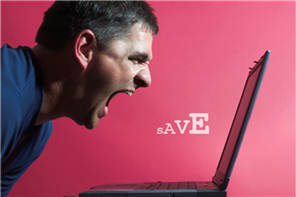 Document management – same approach as for project management. The product related documentation needs to exist and secured. Customer specific documentation can be generated often automatically. Product Configurator – the reason I write it as optional, is because the target is order execution, which is not a PLM role anymore. The ERP system should be able to resolve the full mBOM for an order. The PLM product configuration definition is done through Product and Item management. Depending on the customer environment the role of configurator might be found in PLM in case ERP does not have the adequate tools. Continuing the posts on Bill of Material handling for different types of companies, this time the focus on BOM handling in a Build to Order process. When we are talking about Build to Order process, we mean that the company is delivering solutions for its customers, based on existing components or modules. A typical example is the food processing industry. In order to deliver a solution, a range of machinery (ingredient manipulation) and transporting systems are required. The engineering tasks are focused on integrating these existing components. In many cases new or adjusted components are required to complete the solution. In a typical BTO company you see actually two processes. An R&D department, which explores new technologies and develops new components or modules, which will become available for selling to new customers. This is the innovation engine of the company and often can be found in a complete isolated environment – extra security – no visibility for other departments till release. The task for this R&D department is to develop machinery or modules based on new, competitive technologies, which are rapidly configurable and can be used in various customer solutions. The more these machines or modules are configurable, the better the company can respond to demands from customers, assuming a generic machine and interfaces does not degrade performance, compared to optimal tuned machinery. I will describe the BOM handling for this department in a future post, as also here you will see particular differences with the ETO and BTO BOM handling. We see here the Bidding phase where a conceptual BOM is going to be defined for costing. Different from the ETO process, the bidding company will try to use as much as possible known components or technology. 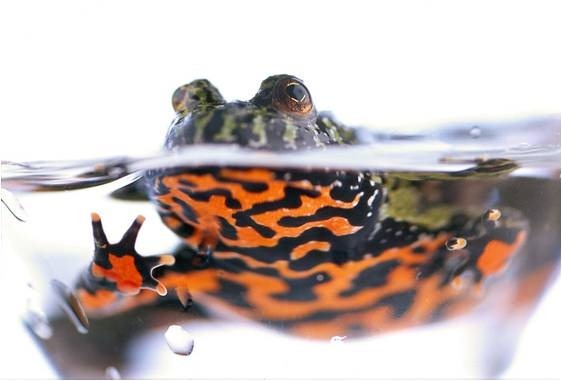 The reason is clear: it reduces the risk and uncertainties, which allow the bidding company to make a more accurate and competitive cost estimate for these parts. When a company becomes mature in this area, a product configurator can be used to quantify the estimated costs. The result from the bidding phase is a conceptual BOM, where hopefully 60 % or more is already resolved. Now depending on the amount of reuse, the discussion comes up: Should modifications being initiated from the eBOM or from the mBOM? In case of 60 % reuse, it is likely that engineering will start working around the eBOM and from there complete the mBOM. Depending on the type of solution, the company might decide to handle the remaining 40 % engineering work as project unique and treat it the same way as in an ETO process. This means no big focus on the mBOM as we are going to produce it only once. I have worked with companies, which tried to analyze the 40 % customer specific engineering per order and from there worked towards more generic solutions for future orders. This would mean that a year later the same type of order would now be defined for perhaps 80 %. Many companies try to change themselves from a project centric company towards a product centric company, delivering configured products through projects. 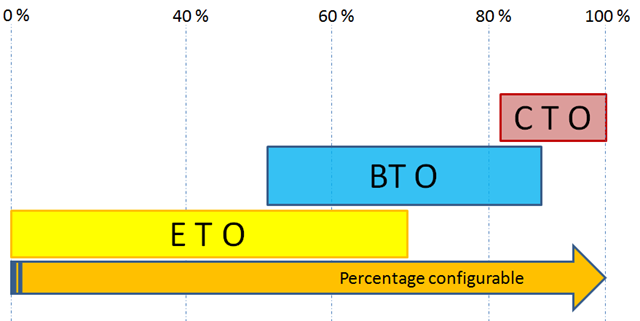 Of course when solutions become 100 % configurable, we do not speak from BTO anymore, but from Configure to Order (CTO). No engineering is needed; all components and interfaces are designed to work together in certain conditions without further engineering. As an example, when you buy a car or you order a PC through the internet – it is done without sales engineering – it is clearly defined which options are available and in which relation. However the higher the amount of reuse, the more important it becomes to work towards an mBOM, which we will than push the order to ERP. And this is the area where most of the discussions are in a PLM implementation. Are we going to work based on the mBOM and handle all required engineering modifications from there? Do we first work on a complete eBOM and once completed, we will complete the mBOM? The reuse from existing components and modules (hardware) is one of the main characteristics of BTO. Compare this to ETO where the reuse of knowledge is the target no reuse of components. The animation shows the high level process that I discussed in this post. What PLM functions are required to support Build to Order ? 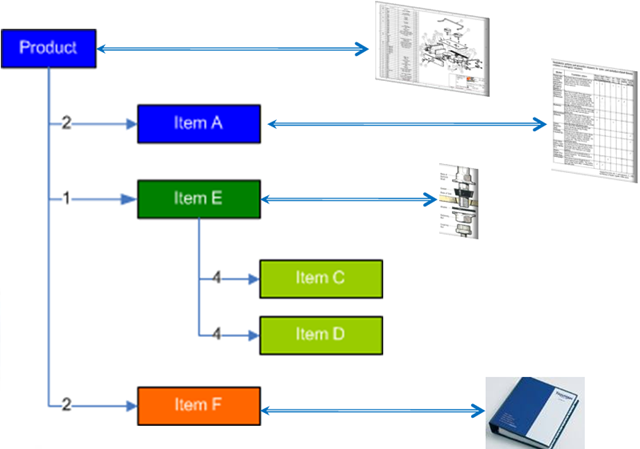 Item management – The main activities here are in the mBOM area. 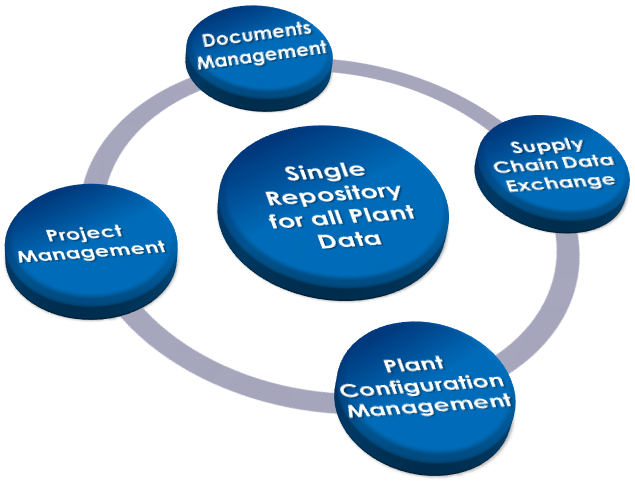 As items in a BTO environment are reused, it is important to provide relevant ERP information in the PLM environment. Relevant ERP information is mostly actual costs, usage information (when was it used for the last time) and availability parameters (throughput time / warehouse info). As historically most of the mBOM handling is done in ERP, companies might not be aware of this need. However they will battle with the connection between the eBOM in PLM and the mBOM (see many of my previous posts). As part of the BTO process is around engineering, an EBOM environment with connections to specifying documents is needed. This requires that the PLM system has eBOM/mBOM compare capabilities and an easy way to integrate engineering changes in an existing mBOM. Workflow processes – As we are dealing with standardized components in the BOM, the Engineering Change Request (ECR) and Engineering Change Order (ECO) processes will be the core for changes. In addition you will find a Bidding Process, a Release process for the customer order, Manufacturer Change Order process and a Standard Item Approval process. A Sales Configurator allowing the sales engineering people to quickly build the first BOM for costing. Working with a Sales Configurator requires a mature product rationalization. When you compare these PLM requirements with the previous post around ETO, you will discover a lot of similarities. The big difference however is HOW you use them. Here consultancy might be required as I do not believe that by having just functionality a company in the mid-market will have time to learn and understand the special tweaks for their business processes. This time a few theoretical posts about BOM handling, how the BOM is used in different processes as Engineering To Order (ETO), Make To Order (MTO) and Build To Order (BTO) organizations and finally which PLM functions you would expect to support these best practices. I noticed from various lectures I gave, from the search hits to my blog and from discussions in forums that there is a need for this theoretical base. I will try to stay away from too many academic terminologies, so let’s call it BOM for Dummies. Note: All information is highly generalized to keep is simple. I am sure in most of the companies where the described processes take place more complexity exists. The majority will talk about the manufacturing BOM (mBOM), which is a structure that contains the materials needed to manufacture a product in a certain order. We will go more in depth into the mBOM later. When you speak with the designers in a company they will talk about the eBOM, which is a structure that contains the components needed to define a product. Both audiences will talk about ‘the BOM’ and ‘parts’ in the BOM, without specifying the context (engineering or manufacturing). So it is up to you to understand their context. Beside these two major types of BOMs you will find some other types, like Conceptual BOM, Customer Specific BOM, Service BOM, Purchase BOM, Shipping BOM. In an Engineering to Order company, a product is going to be developed based on requirements and specifications. These requirements lead to functions and systems to be implemented. For complex products companies are using systems engineering as a discipline, which is a very structured approach that guarantees the system you develop is matching all requirements and these requirements have been validated. In less complex and less automated environments, you will see that the systems engineering is done in the head of the experienced engineers. Based on the requirements, they recognize solutions that have been done before and they build a first conceptual structure to describe the product. This is a conceptual BOM, often only a few levels deep, and this BOM is mainly used for costing and planning the work to be done. Depending of the type of engineering company, they are looking for the reuse of functions or systems. The reuse of functions means that you manage your company’s Intellectual Property (IP) where the reuse of systems can be considered as the reuse of standard building blocks (modules) to build a product. The advantage of system reuse of course is the lower risk, as the system has been designed and built and tested before. From the conceptual BOM different disciplines start to work and design the systems and their interfaces. This structure could be named the eBOM as it represents the engineering point of view from the product. In Engineering to Order companies there is a big variation on how to follow up after engineering. Some companies only specify how the product should be made, which materials to use and how to assemble them. The real manufacturing of the product is in that case done somewhere else, for example at the customer site. Other companies still do the full process from engineering and manufacturing. As there is usually no reuse of the designed products, there is also no investment in standardizing items and optimizing the manufacturing of the product. The eBOM is entered in the ERP system and there further processed to manufacture the product. A best practice in this type of environments is the approach that the eBOM is not a 100 % pure the eBOM, also items and steps needed for manufacturing might be added by the engineers as it is their responsibility to specify everything for manufacturing without actually making the product. – The eBOM might be derived from the mechanical 3D CAD structure and further extended from there. Let me know if this kind of posts make sense for you …..